• Sideline play needs to be called early so we can set up properly, with best shooter setting up on ball-side low post. • 1 man sets away screen on 5. • Passer looks for entry pass to 5 man who should look to seal for the easy 2-point basket. 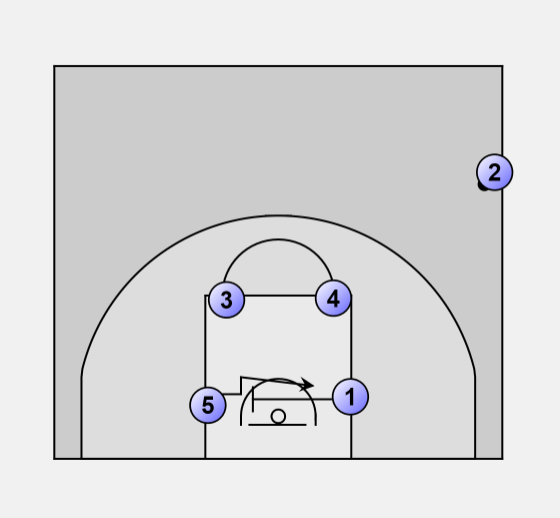 • 3 and 4 man set a double down screen for 1, who cuts high looking for pass to shoot the 3. • The 3, 4, and 5 men are then in prime rebounding position if the shot misses.